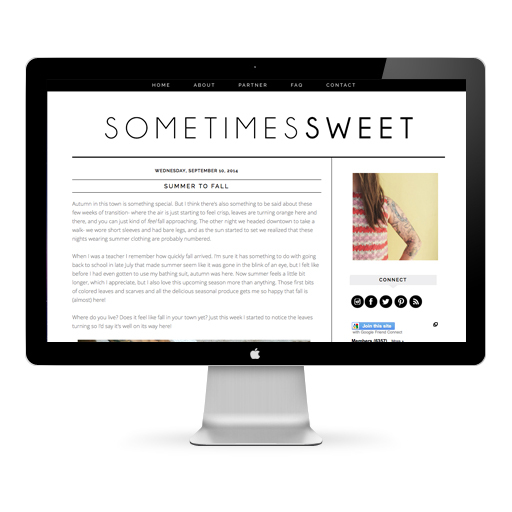 Sometimes Sweet: Sometimes Sweet has a new look! Sometimes Sweet has a new look! As much as I loved my old design by my friend Liz, I was ready for a change. It's always fun to switch things up, and with the change of seasons and so many new ideas, I'm excited for something new. I went a very un-fancy route and bought a design via Etsy! I am so pleasantly surprised though, and I can't say enough good things about Kate over at 17th Avenue Designs. She's so easy to work with and got back to me right away with answers to any questions I had. I can't recommend them enough. So, welcome to the new Sometimes Sweet! Clean, simple, easy to read and navigate. Please let me know if you run into any issues. I still have to update the pages up top and my bio photo, but I couldn't wait to share. And please let me know what you think! Thanks so much for stopping by (and reading!). it's always a pleasure to read you Danny, what a nice new design! This looks great, I didn't even know you could buy themes on etsy! I love this new layout. I immediately forgot what the old page looks like, however, which makes me kind of sad. Nice change!! I love coming here to read your blog! Keep up the good work mama! I like it! But the gray that the post is written in is a bit hard to read. I love simple, clean designs! I just moved my blog to a website (!!!) and bought a theme from Etsy. I think I may have even browsed 17th Avenue! The blog looks great! I love the design, because I am completely biased to a clean and simple design plus an easy buy myself ;) Less is more in this saturated world of online advertising etc. I just did the same thing and I must say I'm very happy with how it turned out. Love the simplistic look of yours. Perfect! nice!! it looks really good! Looks great! You mentioned on your FAQ that you use a pancake lens as an everyday lens, does the long reach of it ever bother you, or did you just have to get used to it? It just feels so awkward to me having to stand so far away from the subject! It looks great! Congratulations on your blog's new look! I had no idea you could buy blog designs on Etsy! Love the new look and how classy/clean it is.